In this edition we look at the "RISE of the Circular Economy in Asia", the OPPORTUNITIES of the Blue Economy (that incorporate the Circular Economy), EVENTS to up-skill and open the door to these opportunities and AWARDS to help you promote your hard work! As populations grow, resources dwindle and commodity prices rise, there's no question we need to decouple economic growth from resource consumption. And the Blue Economy which encompasses the green, new, purpose, share and circular economies - provides us the framework encompassing principles, methodologies, business and economic models and innovations to address many of the challenges we face. We realise there is no silver bullet, and it needs policy, investment, education as well as a robust framework to work in harmony as drivers - however in my view (and that of many others around the word) the Blue Economy is pretty darn close to being the model to deliver true sustainable development. It's expected to generate 100 million new jobs in the next 10 years based on 100+ game changing innovations. So for this edition my aim is to help you understand more about the Blue Economy and how it differs from the Circular Economy - to open up a world of new opportunities, cash flows and profits whilst enabling sustainable productivity and growth for virtually every part of the economy. 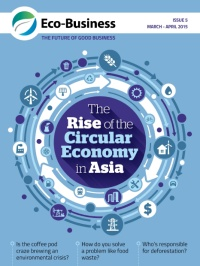 Our thanks and congratulations to Jessica Cheam and the team at Eco-Business in Singapore who have just released The RISE of the CIRCULAR ECONOMY in Asia. It was my pleasure to contribute to it - and hope it helps YOU realise the potential of the Circular Economy within your own organization and industry. We also hope it gives insight for policy makers too - as only if work together, will we truly open up new opportunities and spark a revolution in the way resources are used. If you want to discover more about the Blue Economy (BE) and address questions like What is the difference between the circular economy and the Blue Economy? ; How can companies who are interested begin to apply this to their businesses? How can business and industry as well as governments across the Asia Pacific region encourage more application of these concepts among companies? and discover more of the Blue Economy in action - check out our BE FAQ. The Blue Economy not only incorporates radical resource productivity, it also incorporates whole systems design, industrial ecology, bio-mimicry, renewable energy, green chemistry and nanotechnology. The World Economic Forum estimates that 80% of the US$3.2 trillion value of the global consumer goods sector is lost irrecoverably each year due to the current inefficient linear "make, take waste" model. How much of that belongs to you? How much of it do you want? There's plenty of it to go around. 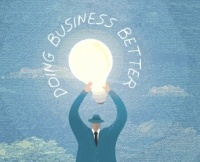 Discover how to get it in our Doing Better Business workshops. CSR is Dead. From here its about transformation. Usership not ownership is the name of the game in the circular economy! Bill McDonagh shares thoughts on endless resourcefulness and the circular economy. Believe that you can. Meet the man shaping 21st century sustainability. Feature EVENTS to help you learn, grow and prosper. The Blue Economy is doing better Business. To help business, industry and government drill down on the opportunities of the Blue and Circular Economies, to understand how to achieve zero waste and to tap into the business models, methodologies, technologies and innovation, we invite you to join us for a one day workshop. Discover where your opportunities lie and how to turn them in to profits. There's a plethora of powerful sustainability solutions your boss will love, and the chance to work with your industry and the community to generate jobs. This is the vanguard set to generate 100m new jobs in the next 10 years all with zero waste using what you have locally. Can you afford not to know about it? If you live outside of these locations, talk to use about how we can deliver one to your local community. It's ideal for transition towns, Cittaslow communities, business and industry groups, farmers, entrepreneurs, policy makers, miners, economic development officers, sustainability and innovation managers - even those who work in disaster management and recovery. If there is one thing on which majority of sustainability advocates agree it's that the linear make-use-dispose model on which we built our society needs ditching for good. So If you have a thirst for learning, are looking for new opportunities for your business, industry or community - then come join us to discover a new world of opportunities. Master the Art of Communicating Sustainability. As sustainability evolves, so too do the rules, the tools and the strategies you need to communicate your programs. As a result of more than 10 years work by European sustainability leaders - a new message and a new toolkit for telling it has emerged. Join us for a one day workshop that will give you all the tools required to Master the Art of Communicating Sustainability. - Being an extension of Public Relations? - Being ignored by Operations busy doing "the real work"? Then come along and learn the best practice global principles for communicating sustainability along with the 4 step process to develop a sustainability narrative. These tools will enable you to set effective strategy, engage your stakeholders and tell your story. We'll provide an array of examples, case studies and tools that promise to rekindle your enthusiasm for the job at hand and evoke action to help you achieve your sustainability goals. Poor communication - not the science - has been the biggest barrier the world over to the uptake of sustainability. Let us help focus your thinking and provide you a proven, manageable yet brilliantly challenging approach. You'll come away with a new understanding of what to do next, what you are missing out on and what you can do better. This symposium will bring together national and international experts, researchers and industry practitioners to address a growing need to enhance liveability, encourage biodiversity and reduce impact on the natural environment. Nominations for the World Environment Day Awards 2015 are NOW OPEN until Friday 17 April. Each year, in support of United Nations World Environment Day (June 5), the United Nations Association of Australia recognises innovative and outstanding environmental programs and initiatives from across Australia and the important work of Australian environmental leaders through its World Environment Day Awards. nominations from individuals, organisations, businesses, local councils, schools, journalists and community groups whose work serves to protect, manage or restore our natural heritage. Check out the various award categories and details on how to register forms and more information about how to enter see here. Nominations close at 5pm AEST on Friday 17 April. 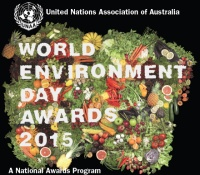 Winners of the 2015 World Environment Day Awards will be announced at the Awards Presentation Dinner to be held on Friday 5 June in Melbourne. You can see a short summary on last years winners here. Congratulations to the winners and to all who are contributing to making our world more livable today and for future generations. If you are serious about sustainability (regardless of your size) this is one awards program I highly recommend you enter. It's a great way to show your leadership, inspire others and receive local, state and national recognition for your efforts. I hope you have enjoyed this edition of MOSS News Views and Events. Our thanks to Eco-Business and Green-Biz for allowing us to share their stories. If you like what you have read, please share it with friends, colleagues clients and maybe even your local MP! After all, we need strong policy if we are going to sustain our world, have food, water and energy security and employment and wellbeing for all. I look forward to seeing you somewhere around the country in the coming weeks and to helping you, your organisation and or community take advantage of the opportunities afoot to grow, transform and prosper.